← Library Board Member Needed! Having a healthy home doesn’t have to be complicated. Looking for a better option? Join green living guide Amy Niemann as she shows you how to ditch those toxins and switch to healthy and effective alternatives! 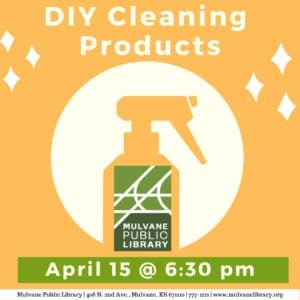 Amy Niemann will be at the Library leading a Switch and Ditch discussion for a variety of cleaning products. She will be discussing different products and safer alternatives for them, many you can make for yourself at home! She will also share other tools you can use to help make your home cleaner from toxins!